At the age of 17 he taught drawing classes at a local night school. The following year, inspired by his older brother Mark Simon, Len attended Sheridan College to pursue his passion for animation. After completing his first year of college, Len was recruited by Sullivan/Bluth Studios Ireland, where he was rapidly promoted to Directing Animator. 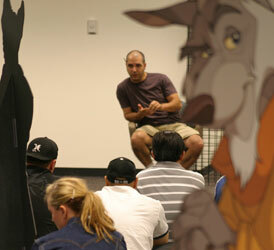 From Ireland, he moved to Phoenix, AZ in 1994 and was one of the original staff of Fox Animation Studios. While at Fox, Len was one of the main leads on Anastasia and was promoted to Animation Director in charge of all the character animation on Bartok the Magnificent and Titan AE. With Fox Animation’s closure in 2000, Len established his own studio with his business partner James Stoyanof. Len has worked on more than a dozen classically animated feature films, recent films include: Prince of Egypt, Spirit: Stallion of the Cimarron, 8 Crazy Nights, Fat Albert, Curious George, as well as a number of European animated features. His experience also includes television work, CD Rom, internet games, casino games, animated shorts, commercials and animated pilots. 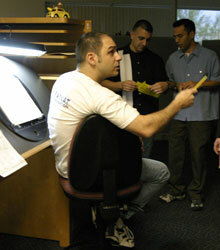 Len’s ability has progressed to encompass all aspects of animation from storyboard and development to post production. His hands-on style of management has made Len one of the most accomplished figures in animation.